Take a look at this sign. I saw it at a rest stop off of northbound I-75, just south of Gainesville, Florida. Notice anything wrong with it? I did, and I’m sure a lot of you do, too. 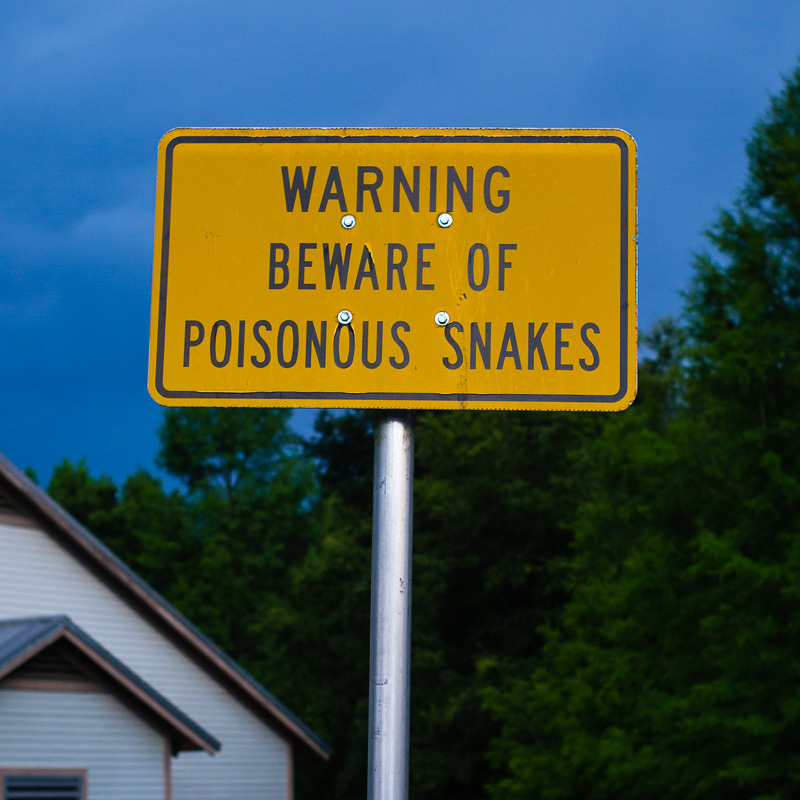 The problem, besides snakes loitering around rest stops, lies with the word “poisonous.” Snakes aren’t poisonous, they’re venomous. Semantics aside, is there a difference? Of course there is, I didn’t take a picture of that sign for nothing. A poison is anything that can cause bodily harm, and is usually active when ingested or touched. Examples are nicotine inhaled into the lungs, taken orally, or absorbed through the skin. Some are extremely potent and dangerous, like strychnine, while others are a part of everyday life, yet still harmful, like caffeine. Peruse through this blog, there are plenty of examples. Poisons, especially ones coming from plants, are used defensively, as a way to keep herbivores and insects from eating them. They are secondary metabolites – not necessary for growth or reproduction – and distributed throughout the plant. So just what are venoms, then? Venoms are related to poisons, and specifically refer to hazardous substances that are injected. Injected is the key here. Think about spiders, snakes, bees, and platypus. Yes, platypus are venomous, via a spur in the male’s hind leg. Pretty cool, huh? I haven’t written much about venoms, but I will. The venom of these creatures are made and stored in glands and used either defensively or offensively, depending on how much you’ve annoyed the creature. The venom is localized in just one part of the animal, not dispersed throughout. So that’s why snakes aren’t poisonous. You can eat a snake and feel no ill effects – it tastes like chicken, or so I’m told. You can even ingest the venom – though I don’t recommend it – and be OK. There are people that do this for “health” and “longevity” reasons and some that drink the venom as a sideshow attraction, so have at it. What about frogs? They secrete harmful substances onto their skin. Not a venom, despite the glandular formation. It has to be injected, remember? What about curare? It has to be injected to be harmful. Not a venom, it’s not created or stored in glands. If you bite it, and you become ill, it’s a poison. If it bites you, and you become ill, it’s a venom. The good news is that not too many people would be confused by the offending sign. Poisonous or venomous, people understand that equals harm. But we should at least strive to get it right. What say you Florida Department of Transportation? Tags: Florida, poison, sign, snake, venom. Bookmark the permalink. I think you’d be OK, but I’m not going to try it. I just knew someone would ask that. I guess you’re the winner!